In the United States, fatal falls increase from 17% among adults aged 65 to 74 to 47% in those over the age of 80.4 Therefore, the need to identify early markers that place individuals at high risk for falls is imperative. A further challenge is that current fall research has focused on clinical impairments in gait, balance, cognition, and other sensory functions that predict falls,5,6 and little is known about biological processes that precede the occurrence of clinical impairments that lead to falls. The formative observation by Lundin-Olsson and colleagues, who noticed that nursing home residents who stopped walking when talking were at higher risk of falls,7 has spurred exploration of real world divided-attention tasks to identify older adults at high risk for falls. These paradigms are designed to understand fall risk by examining performance of individuals as they walk while simultaneously conducting cognitively demanding tasks such as reciting alternate letters of the alphabet or counting backward from 100 by sevens. The primary goal of the study was to determine whether brain activity in the prefrontal cortex measured during walking using fNIRS technology predicts falls in high-functioning older adults. We hypothesized that increased magnitude of prefrontal cortex activation during WWT would predict falls in high-functioning community-dwelling older adults. We conducted a prospective study of 166 high-functioning older adults enrolled in the Central Control of Mobility in Aging study at Albert Einstein College of Medicine. High-functioning status was defined as absence of dementia and disability and with normal gait diagnosed by study clinicians in participants aged 65 and older. Task-related changes in oxygen levels in the prefrontal cortex were measured using fNIRS during single task conditions, motor (normal pace walking) and cognitive (standing while reciting alternate letters of the alphabet), as well as a dual task condition (walking while reciting alternate letters of the alphabet, ie, WWT). Incident falls were prospectively assessed every two to three months over a 50-month study period. Over the study period, 71 participants reported 116 falls, with a median time to first fall of 19.5 months. Results showed that each standard deviation increase in brain activity levels during WWT was associated with a 32% increased risk for falls during the next four years. The association remained after accounting for multiple established clinical fall risk factors including cognitive status, slow gait, previous falls, and frailty. Although previous studies have shown that gait speed during WWT predicts falls in older adult populations,8,10 in this high-functioning sample, neither gait speed nor the letters recited during WWT predicted falls. Similarly, brain activation during both of the single task conditions did not predict falls. These findings provide evidence that brain activity patterns during dual tasks may indicate risk of falls in high-functioning older adults before any visible signs of clinical dysfunction and may not be elicited by more simple tasks such as walking or talking alone. Additionally, these results show that dual task assessments can strain cognitive reserves in cognitively and physically healthy older adults. The relationship between cognitive interventions and their effect on gait, balance, and fall risk are being explored in recent studies.28-30 Dual task performance was reported to improve by training28,29 and could be studied as a novel fall prevention strategy. These preliminary studies support the feasibility and validity of cognitive-based approaches as a novel nonpharmacological means of modifying gait performance as a fall prevention strategy to improve mobility. From a clinical perspective, findings from our study suggest that there may be changes in brain activity patterns before physical symptoms manifest in high-functioning older people who are at risk of falls. These alterations in brain activity patterns without obvious behavioral manifestations may be used to assess fall risk and implicate neural processes early in the pathogenesis of falls. In the future, a simple brain scan assessment such as fNIRS might be used to help predict falls in high-functioning older adults. Clinicians may be able to use this information to recommend behavioral and lifestyle modifications or treatments for their patients that may reduce the risk of future falls. Future research is needed to find the underlying biological mechanisms or diseases that may be altering brain activity and how to correct them at an early stage in order to prevent future falls. 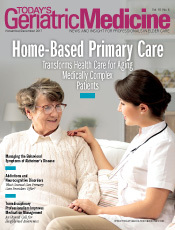 — Emmeline Ayers, MPH, is the associate for the division of cognitive and motor aging (neurology) and geriatrics (medicine) at Albert Einstein College of Medicine in New York. 1. Sattin RW. Falls among older persons: a public health perspective. Annu Rev Public Health. 1992;13:489-508. 2. Carroll NV, Slattum PW, Cox FM. The cost of falls among the community-dwelling elderly. J Manag Care Pharm. 2005;11(4):307-316. 3. Burns ER, Stevens JA, Lee R. The direct costs of fatal and non-fatal falls among older adults — United States. J Safety Res. 2016;58:99-103. 4. Stevens JA, Corso PS, Finkelstein EA, Miller TR. The costs of fatal and non-fatal falls among older adults. Inj Prev. 2006;12(5):290-295. 5. Tinetti ME. Clinical practice. Preventing falls in elderly persons. N Engl J Med. 2003;348(1):42-49. 6. Tinetti ME, Speechley M, Ginter SF. Risk factors for falls among elderly persons living in the community. N Engl J Med. 1988;319(26):1701-1707. 7. Lundin-Olsson L, Nyberg L, Gustafson Y. "Stops walking when talking" as a predictor of falls in elderly people. Lancet. 1997;349(9052):617. 8. Verghese J, Kuslansky G, Holtzer R, et al. Walking while talking: effect of task prioritization in the elderly. Arch Phys Med Rehabil. 2007;88(1):50-53. 9. Montero-Odasso M, Verghese J, Beauchet O, Hausdorff JM. Gait and cognition: a complementary approach to understanding brain function and the risk of falling. J Am Geriatr Soc. 2012;60(11):2127-2136. 10. Ayers EI, Tow AC, Holtzer R, Verghese J. Walking while talking and falls in aging. Gerontology. 2014;60(2):108-113. 11. Verghese J, Buschke H, Viola L, et al. Validity of divided attention tasks in predicting falls in older individuals: a preliminary study. J Am Geriatr Soc. 2002;50(9):1572-1576. 12. Holtzer R, Friedman R, Lipton RB, Katz M, Xue X, Verghese J. The relationship between specific cognitive functions and falls in aging. Neuropsychology. 2007;21(5):540-548. 13. Nadkarni NK, Levine B, McIlroy WE, Black SE. Impact of subcortical hyperintensities on dual-tasking in Alzheimer disease and aging. Alzheimer Dis Assoc Disord. 2012;26(1):28-35. 14. Annweiler C, Beauchet O, Bartha R, et al. Motor cortex and gait in mild cognitive impairment: a magnetic resonance spectroscopy and volumetric imaging study. Brain. 2013;136(Pt 3):859-871. 15. Sheridan PL, Hausdorff JM. The role of higher-level cognitive function in gait: executive dysfunction contributes to fall risk in Alzheimer's disease. Dement Geriatr Cogn Disord. 2007;24(2):125-137. 16. Kearney FC, Harwood RH, Gladman JR, Lincoln N, Masud T. The relationship between executive function and falls and gait abnormalities in older adults: a systematic review. Dement Geriatr Cogn Disord. 2013;36(1-2):20-35. 17. Holtzer R, Verghese J, Xue X, Lipton RB. Cognitive processes related to gait velocity: results from the Einstein Aging Study. Neuropsychology. 2006;20(2):215-223. 18. Beauchet O, Annweiler C, Dubost V, et al. Stops walking when talking: a predictor of falls in older adults? Eur J Neurol. 2009;16(7):786-795. 19. Cham R, Studenski SA, Perera S, Bohnen NI. Striatal dopaminergic denervation and gait in healthy adults. Exp Brain Res. 2008;185(3):391-398. 20. Bunce SC, Izzetoglu M, Izzetoglu K, Onaral B, Pourrezaei K. Functional near-infrared spectroscopy. IEEE Eng Med Biol Mag. 2006;25(4):54-62. 21. Izzetoglu K, Bunce S, Izzetoglu M, Onaral B, Pourrezaei K. Functional near-infrared neuroimaging. Conf Proc IEEE Eng Med Biol Soc. 2004;7:5333-5336. 22. Izzetoglu M, Bunce SC, Izzetoglu K, Onaral B, Pourrezaei K. Functional brain imaging using near-infrared technology. IEEE Eng Med Biol Mag. 2007;26(4):38-46. 23. Holtzer R, Epstein N, Mahoney JR, Izzetoglu M, Blumen HM. Neuroimaging of mobility in aging: a targeted review. J Gerontol A Biol Sci Med Sci. 2014;69(11):1375-1388. 24. Bookheimer SY, Strojwas MH, Cohen MS, et al. Patterns of brain activation in people at risk for Alzheimer's disease. N Engl J Med. 2000;343(7):450-456. 25. Holtzer R, Mahoney JR, Izzetoglu M, Izzetoglu K, Onaral B, Verghese J. fNIRS study of walking and walking while talking in young and old individuals. J Gerontol A Biol Sci Med Sci. 2011;66(8):879-887. 26. Holtzer R, Mahoney JR, Izzetoglu M, Wang C, England S, Verghese J. Online fronto-cortical control of simple and attention-demanding locomotion in humans. Neuroimage. 2015;112:152-159. 27. Sorond FA, Cruz-Almeida Y, Clark DJ, et al. Aging, the central nervous system, and mobility in older adults: neural mechanisms of mobility impairment. J Gerontol A Biol Sci Med Sci. 2015;70(12):1526-1532. 28. Schwenk M, Zieschang T, Oster P, Hauer K. Dual-task performances can be improved in patients with dementia: a randomized controlled trial. Neurology. 2010;74(24):1961-1968. 29. Verghese J, Mahoney J, Ambrose AF, Wang C, Holtzer R. Effect of cognitive remediation on gait in sedentary seniors. J Gerontol A Biol Sci Med Sci. 2010;65(12):1338-1343. 30. Mirelman A, Maidan I, Herman T, Deutsch JE, Giladi N, Hausdorff JM. Virtual reality for gait training: can it induce motor learning to enhance complex walking and reduce fall risk in patients with Parkinson's disease? J Gerontol A Biol Sci Med Sci. 2011;66(2):234-240. 31. Verghese J, Ayers E, Mahoney JR, Ambrose A, Wang C, Holtzer R. Cognitive remediation to enhance mobility in older adults: the CREM study. Neurodegener Dis Manag. 2016;6(6):457-466.